Lami is a Nord apothecary and the proprietor of the Thaumaturgist's Hut, an alchemy shop in Morthal. She is also the common trainer in alchemy. During the day she can be found at her store until it closes at 8pm, when she will head home for a quiet night with her husband Jorgen. She wears a belted tunic and a pair of boots, and is equipped with an iron dagger. She carries the key to her house, the key to her store, a torch, and a selection of common loot and gold. When talking to you, Lami's greetings almost always focus on either her store, or work in general. "If you need any alchemy supplies, I'll do my best to provide them. Assuming I haven't used them all up. ", "Jorgen and I both work hard, all the time. Morthal is important to both of us. ", "I don't get many customers, but that leaves me time to try things out. Experiment, I guess. ", "Oh, do come in! I hope I have what you need." If you ask her if she has trouble getting supplies she will say "No, no. Well, sometimes, but that's not the problem. I just often don't have much to do, so I tend to... I try things out. They don't usually work, but I try. Next thing I know, I've used up most of my stock." You can also ask Lami how long she has studied alchemy, to which she will say "I picked up the trade when I was a girl. One of the temple healers staying here on a pilgrimage showed me the basics. She had a book with her, "Song of the Alchemists," that I used to read over and over. I miss having a copy." If you respond that that's too bad she'll say "I suppose it is." Should you say that you will bring her a copy, she'll positively respond with "Really? I'd be happy to show you a bit about herbs if you find the book." When you return to her with the book, she'll say "It's amazing how much you can learn from a book. Here. Let me show you some of the things the temple healers taught me about potions." During the quest Laid to Rest, Lami will be part of the short-lived mob that heads to Movarth's Lair and disbands soon after. When asked for training, she will tell you "I think I can teach you a thing or two." Angeline Morrard in Solitude will refer you to Lami when asked if she can train you in alchemy by saying "No, no. Mostly, I'm just a simple herbalist. Lami over in Morthal should be able to help you." 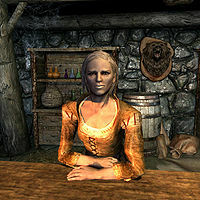 Milore Ienth, a resident of Raven Rock, will also mention Lami when asked where she learned her alchemy skills, stating "After we left Morrowind, we found ourselves in Skyrim. We wandered around a bit and ended up in Morthal where we took temporary residence with Lami, the town's alchemist. I was fascinated by her work, and over a period of a few years she taught me quite a bit." Lami: "Is there something you need, dear?" Idgrod: "I... I'm not sure. I think perhaps, but I don't know what it is." Lami: "All right, can you describe it to me?" Idgrod: "No, I'm sorry. I'll just... I'll know it if I find it. Does that make sense?" Lami: "If it does to you, dear, that's all that matters." Idgrod: "I like your shop, Lami." Lami: "Thank you, dear. It must be nice to get out of the hall every now and then." Idgrod: "Oh, I quite like living in the hall. Mother says it's an honor to live there and serve Morthal." Lami: "Oh, of course! I'm sorry, I didn't mean to say that it's not." Idgrod: "Morthal will be mine to govern someday. I have a great deal to learn." Lami: "Yes, I'm sure that's true." Lami: "How are the headaches, dear? You or your mother still having them?" Idgrod: "Oh, yes. All the time. They come with the visions, as always." Lami: "Are you sure you don't want something for them? I may be able to brew you something to help." Idgrod: "Oh no! I couln't. Mother says they are a burden we must bear for our gift." Lami: "Well dear, you know where to find me if it ever becomes too much for you." Since Lami doesn't live in her shop, she may not be there when the store is scheduled to open at 8am. She doesn't leave her house until around 8am and it may take her up to an hour to walk there. She won't offer services until she's inside. Lami is a very good friend of Alva, and will become very rude towards you (-2 relationship, Foe) if you kill Alva, even in self defense. 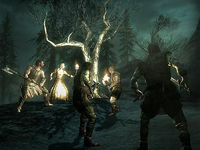 This issue has been addressed by version 3.0.1 of the Unofficial Skyrim Legendary Edition Patch; Lami's relationship rank with Alva will be dropped to 0 as soon as Alva becomes hostile towards the player. This page was last modified on 22 November 2018, at 03:50.